“The Algorithm.” It sounds like something ominous out of scifi – an AI character from The Matrix, maybe. It’s the name for the proprietary system by which Facebook shows you content. And this element of social media has been under fire lately, even on the global political scale. Computer rules are invisibly determining what you see. And they don’t necessarily work for you. Like a drug dealer, they’re there to keep you hooked. And since they can be bought, they’re also there to ensure publishers buy advertising to be noticed. Okay, that sounds scary. On the other hand, you’re sitting at a computer. You’ve got tools to make this work for you. So rather than process this information passively (which is indeed scary), take control. I hope we’ll focus a lot on that in the coming months. And that’s especially essential with music. You wouldn’t just buy whatever music was at the top of the Billboard charts and listen to that exclusively 24/7 for the rest of the month. So it makes sense to take some active role in the music you get from social media, too. And let’s be honest: right now, Facebook isn’t so great for music. Artist pages lack basic tools like an internal official player. Then content gets lost amidst political news and baby pictures. Facebook has gotten loads of press lately over whether content shared by friends or news stories get precedent. One thing you’ll never hear about, though, is music. I can imagine some reasons for this. Facebook may be worried about getting slapped with licensing fees. They may be unable to monetize the music content itself (particularly as regards advertising). They may have internal statistics that show average users don’t want self-promotional posts from artists they follow as much as they do baby pictures. Music content (heavily linking to YouTube, for instance) may run up against other algorithm rules that simply aren’t weighted for musicians. Or it may be some combination. What I do know is, you can control this. Right now, pick a favorite artist. Hover over the Like button. “Default” means the Algorithm chooses where (or if) you see posts from this artist. 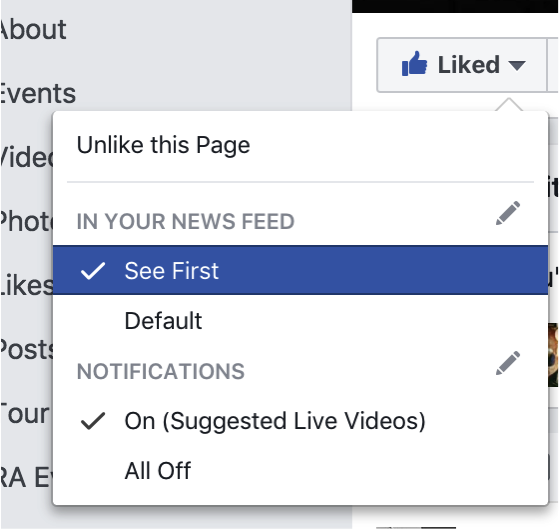 You can choose to see these first with other things that matter to you – both those determined automatically and those people and pages you select. The notifications portion is now a bit confusing. 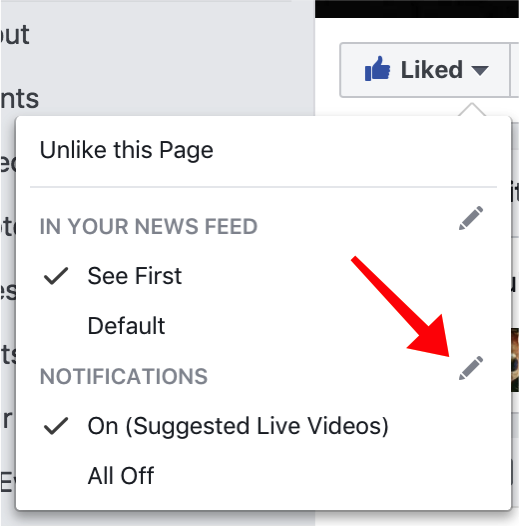 Notifications refer to the little pop-up indications you get from Facebook, as well as those events listed under the globe icon in the upper-right-hand menu. By default, it looks like it’s “on.” It’s not: this actually is only certain Facebook Live video streams. So, if you’re wondering why lately you’ve been getting interrupted with random video feeds you don’t care about, now you know why. 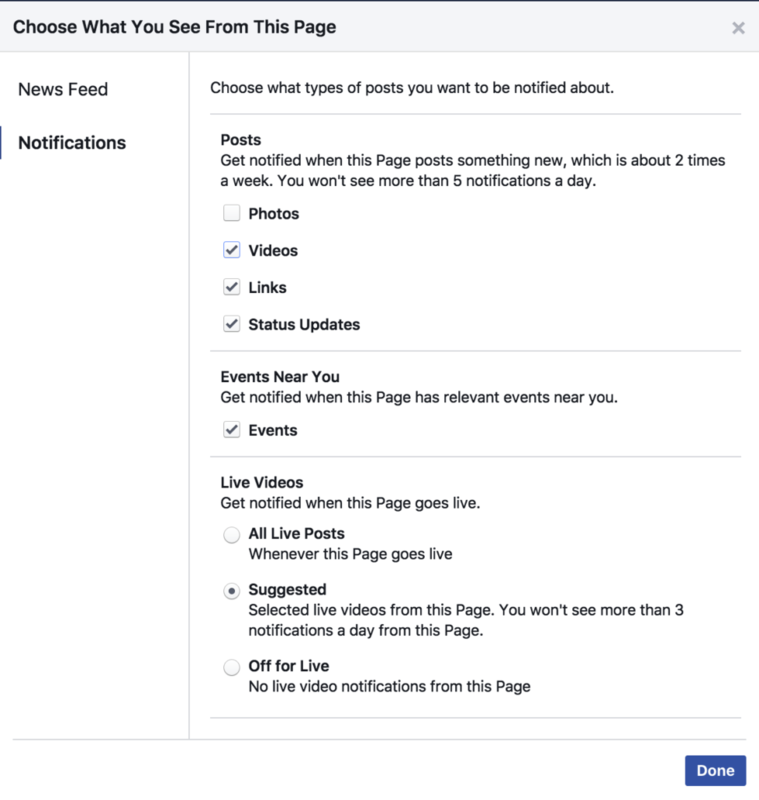 The fact this setting is on by default means that pages (as Facebook hoped) are using them to get your attention. But notice the pencil icon just to the right of Notifications. This gives you a more detailed dialog. Here, you can choose what you care about. For my favorite artists, I’ve set this to notify me of events (at the very least, so I don’t miss a show), and often status updates and links. A link, for instance, will make sure I hear about my favorite artist’s latest release or track or interview. So, wait, why are we signing up for this spam? Music, on the other hand, I believe can totally change your mood. Reason two: artists are finding they have to buy advertising just to be heard. And some are giving up. I think that’s really too bad, and I don’t want the only music links I see to come from artists with deep pockets. I’m not trying to put Facebook Ads out of business. On the contrary, speaking as someone who uses them, the “organic” content (like you’ve done here) can still mix well with paid. Lastly, if you do like and share content from musicians you love, you’ll raise its value in the algorithm. And I think that’s worth it. Oh, PS, if you want to share this article or take these steps with CDM, we’ll love you back. But, for real, do it with some musicians even before us.